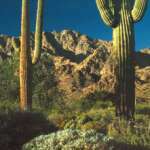 The Cabeza Prieta Wildlife Refuge is situated in southwestern Arizona just west of the town of Ajo. Its southern boundary shares the Mexican/American border with Sonora for 55 miles. The Refuge is 60.5 miles across and 38 miles wide at the widest point. 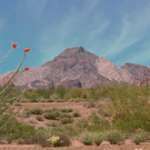 Adjacent to the Refuge on the north and west is the Barry M.Goldwater Military Reservation and to the east and southeast are lands administered by the United States Bureau of Land Management and Organ Pipe Cactus National Monument. See a Physiography map of the Cabeza Prieta Wildlife Refuge. 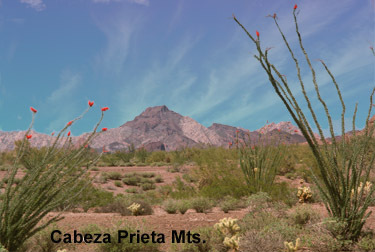 The Cabeza Prieta Wildlife refuge is basically a broad, flat expanse interrupted by a series of mostly northwest-southeast trending mountain ranges. The flat areas between these mountain ranges are called "Deserts" and "Valleys". No permanent, flowing streams exist on the Refuge. After heavy rains, water flows through drainages called washes or arroyos. Such water flows normally don't persist more than a few hours. The direction of water flow in these drainages is generally from south to north. Mountain ranges from west to east are: Cabeza Prieta Mountains, Tule Mountains (mostly south of the Cabeza Prietas), Sierra Pinta, Mohawk Mountains, Bryan Mountains (south of the Mohawks), Granite Mountains, Agua Dulce Mountains (South of the Granites), Growler Mountains and Childs Mountain. Groups of relatively low hills are scattered throughout the area, the principal one being the Antelope Hills. The highest range in the Refuge is the Growler Mountains, whose highest point is Temporal Peak at nearly 3300 feet. Click photos to see full size. 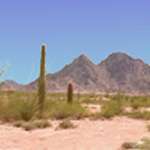 West of the Cabeza Prieta and Tule Mountains is the wide flat expanse called the Lechuguilla Desert. 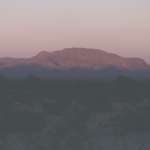 This is bounded on the west off the Refuge by the Tinajas Altas Mountains. 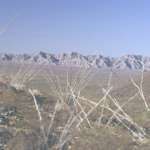 Between the Cabeza Prieta/Tule Mountains and the Sierra Pinta to the east is the Tule Desert. 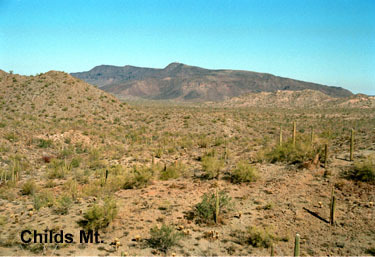 To the southeast of the Tule Desert and south of the Sierra Pinta is an extension of the Mexican Pinacate lava field containing a number of extinct cinder cones and small calderas, the latter visible only from high altitudes. 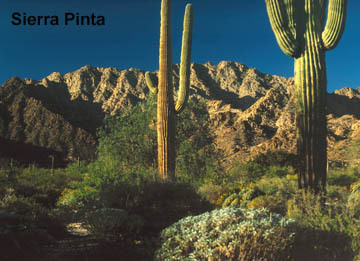 Surrounding the lava field is the Pinta Sands area formed from sand blown northward from Mexico. This dune containing area extends to the base of the Sierra Pinta. The Cabeza Prieta/Tule Mountains group and the Agua Dulce Mountains are broad expanses of peaks and hills not forming well-defined ranges. The mountains in the central part of the area consist of well-defined long narrow ranges that are extremely steep and rough on both sides owing to the type of rock and the particular mountain-building process involved. 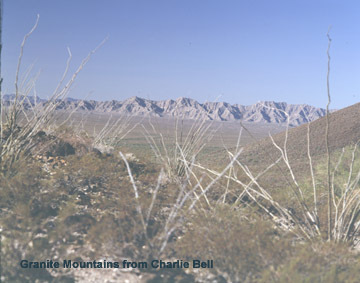 These ranges include the Sierra Pinta, Mohawk Mountains, Bryan Mountains, and the Granite Mountains. 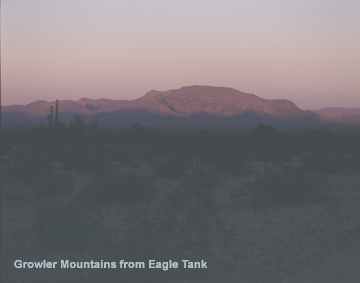 The Growler Mountains and Childs Mountain near the eastern edge of the Refuge are well-defined ranges steep on the western side and gradual on the eastern side. Elevations are highest in the northeastern segment of the Refuge and drop off precipitously down the western slopes of the Growler Mountains. Throughout the Refuge, elevations tend to gradually drop from south to north. The lowest areas are where the Mohawk, San Cristobal and Growler Valleys leave the Refuge. These locations are below 750 feet elevation. Most of the central area lies between 750 and 100 feet elevation. Near and just outside the Pinta Sands area are two depressions, Pinta Playa and Los Playas, that fill with water following heavy rains. Sometimes water may stand in these playas for weeks. Cox,Dennis P., Eric R. Force, William H. Wilkinson, Syver W. More, John S. Rivera, & Joseph L. Wooden. 2006. 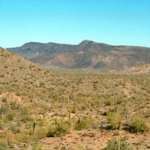 The Ajo Mining District, Pima County, Arizona - Evidence for Middle Cenozoic Detachment and Faulting, Plutonism, Volcanism, and Hydrothermal Alteration. Professional Paper 1733. U.S. Geological Survey, U.S. Dept. of the Interior, Reston VA.
Much of the geology and resulting landforms of the Ajo area are explained and described in detail in this Paper. Although this is a scientific publication aimed at a professional audience, it is written in a way that is accessible to members of the public with a minimal knowledge and a high degree of interest in geological terms and concepts. The ability to understand what was going on is strongly enhanced by the excellent maps and diagrams that accompany the paper. If desired, printed copies may be ordered from the USGS.